What Else Can I Expect From an Online Associate in Elementary Education Program? What Can I Do With an Associate in Elementary Education Degree? Earning an online associate degree in elementary education allows you to work with younger students (up to the sixth grade) as a teacher, teacher's aide, or childcare worker. Associate degrees in elementary education feature courses that combine liberal arts, education and theory, and cultural issues facing children to provide a core understanding of the needs of young learners. An associate in elementary education is also an excellent foundation if you're planning to pursue a bachelor's degree in the field. The employment outlook for preschool teachers is projected to experience 7% growth by 2024, providing numerous job opportunities for students with an associate degree in elementary education. Northeast Community College, located in Norfolk, offers a two-year liberal arts degree in elementary education that transfers directly into a four-year baccalaureate degree in teacher education. Students complete core classes in music, science, math, and professional education along with practical courses in physical education and elementary education. The 60-credit program also requires students to study history, written and oral communication, and social science, and electives are available in foreign language, geometry, and special education. The associate in elementary education is offered both online and on-campus. Students work with advisors to determine which elective courses best suit their needs. Applicants must provide high school or college transcripts along with ACT or SAT scores. NCC maintains a 98% success rate for graduates who find employment soon after graduation. Mississippi Gulf Coast Community College in Perkinston offers an online associate degree in elementary education as the first two years of a four-year degree. As part of the Mississippi Virtual College community, MGCCC offers flexible classes that accommodate students' schedules and educational needs. Coursework for the degree varies depending on whether a student wishes to pursue elementary or middle school education at the baccalaureate level, but core classes cover areas such as English, biology, history, math, and wellness. During their second year, students study literature and public speaking, with elective options in the arts and sciences. Admission to MGCCC's online program is the same as for on-campus students, and any student pursuing a degree in professional education at a Mississippi university must pass a PRAXIS I exam with a composite score of 21. Transcripts from all previous courses are also required. 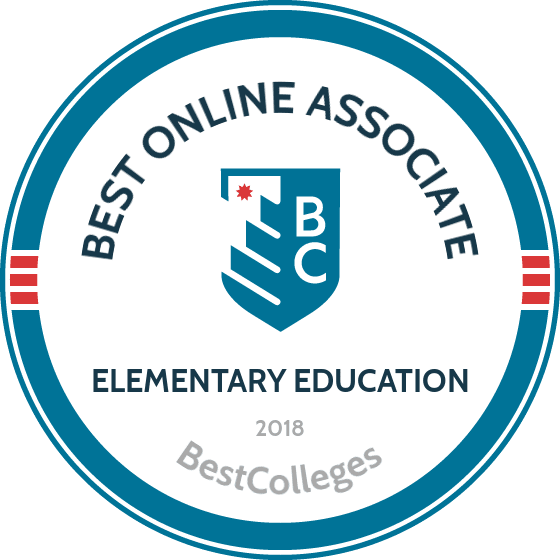 Located in Torrington, Eastern Wyoming College offers an online associate of arts degree in elementary education that satisfies the first 60 credits needed for a four-year degree. Core classes include foundations of education, lab science, and teaching with technology. In addition to core courses, students have seven options for electives, including foreign languages, art, and theater. Applicants need to fulfill prerequisites for some courses and must complete at least three science courses to graduate. Financial aid is available to all students, and the college has numerous private, institutional, and activity grants and scholarships that students can apply to through the EWC online system. EWC has articulation agreements with several colleges in Wyoming, and students wishing to transfer to the University of Wyoming or Chadron State College must satisfy certain prerequisites in educational foundations. All students in the program must complete an education capstone course. Roanoke-Chowan Community College offers an online associate degree in elementary education in partnership with East Carolina University's four-year elementary education program. Located in Ahoskie, R-CCC provides the first two years of the degree online, while East Carolina University offers the second two years. On top of core courses in areas such as English, history, and liberal studies, students in the program can take courses in physical education, health education, and art education. To qualify for the associate degree, students may need to take on-campus developmental courses prior to admission. R-CCC has an open-door admission policy. Freshmen and transfer students must submit a R-CCC application along with all high school and college transcripts. Returning students may need to take a placement exam prior to scheduling courses. Once students complete their core coursework at R-CCC, they begin taking classes as a cohort at East Carolina University during the fall semester. Students are required to participate in a full-time senior-year internship. Lincoln Land Community College offers a two-year associate in elementary education. The main campus is in Springfield, but the college serves students in 15 Illinois counties through outreach centers in Beardstown, Jacksonville, Taylorville, and Litchfield. The program is designed for students who want to enter four-year baccalaureate programs and requires them to complete coursework in history, psychology, art, and politics. Recommended courses include diversity in schools and society, introduction to teaching education, students with disabilities, and health in today's society. Financial aid is available for all students, and LLCC provides information on school-specific scholarships. Education students must earn a "C" or higher in all coursework and are encouraged to pass a Teaching Academic Proficiency exam before continuing on to a four-year degree. LLCC maintains articulation agreements with Illinois College and MacMurray College, both in Jacksonville. Hagerstown Community College provides an online associate of arts in teaching for students who want to specialize in elementary and special education. HCC's program is ideal for students planning to earn a bachelor's degree and the state of Maryland's certification in teaching. The 61-credit program includes coursework in science, history, communication, and special education. Students are also required to complete 45 hours of professional field experience and take classes in fundamental motor skills and fitness, educational psychology, and personal health. Applicants must provide HCC with transcripts and may be required to take placement exams depending on their standardized test scores. In order to complete the online associate degree, students must complete a professional portfolio, have earned a 2.75 GPA, and pass a basic skills test. HCC maintains articulation agreements with four-year schools throughout Maryland. With three campuses and seven learning centers in the Las Vegas area, the College of Southern Nevada offers an associate in elementary education for students seeking four-year degrees or employment as instructional aides. The program consists of 60 to 64 credit hours and can be completed entirely online. Core classes cover subjects such as analytical thought, science, composition, and state and federal government, while major-specific coursework includes classes on instruction with technology, educational concepts, and cultural diversity. To graduate, all students are required to complete a professional portfolio. After earning the associate degree, students can take advantage of the assistance provided by the College Of Southern Nevada's Transfer Center, which advises students as they continue on to four-year programs. The College of Southern Nevada maintains articulation agreements with schools throughout Nevada and around the country. Based in Senatobia, Northwest Mississippi Community College's two-year online associate degree in elementary education prepares future educators to teach kindergarten and elementary-aged students. Core coursework includes subjects such as English, art, music, technology, and the sciences. Transfer and concentration options are available in consultation with an advisor. For some Mississippi public schools, additional coursework is required for both K-6 and grade 7-12 licensure. To receive K-6 licensure, students must complete 18 credit hours in two endorsement areas (English, general science, math, and social science) with a grade of "C" or better in all coursework. An associate degree from NMCC does not guarantee a teaching certificate, but provides the foundation for transfer opportunities and for additional licensure requirements. Applicants must provide a completed application, standardized test scores, and high school transcripts. Financial aid is available for online and traditional students, and online learners pay the same tuition as on-campus students. Arkansas Northeastern College's associate degree in childhood education prepares students for the rigors of a four-year bachelor's program in K-6 elementary education. The 65-credit program includes a wide range of liberal arts, science, and education courses along with classes in the fine arts, English, and literature. Students are also required to take classes in teaching, child growth, and Arkansas history. Students earning the online associate degree in elementary education are able to transfer credits through the Arkansas Course Transfer System. Students can enter ANC during the fall, spring, or summer terms, but admission to the college does not guarantee admission to any specific program. To graduate, students must maintain a 2.0 GPA. If students wish to continue on to Arkansas State University for a baccalaureate degree, they must maintain a 2.7 GPA and pass the PRAXIS basic skills test. Located in Prescott, Yavapai College offers a 62-credit associate of arts degree in elementary education. The degree is designed for students continuing on to a public university in Arizona for a four-year elementary education degree and Arizona teaching licensure. General education requirements cover the fundamentals of science, math, and writing. To graduate, students must complete the following course requirements: one class in communication; one class with an intensive writing requirement; one class with an race awareness emphasis; and one course with a global or historical awareness component. Students must receive a "C" or higher in all coursework to transfer to a baccalaureate program in Arizona. An online associate degree in elementary childhood education usually requires the completion of 60 credit hours over the course of two years. Credits may include practical experiences and community engagement, giving you a chance to work hands-on with students, mentors, and professional educators. Online associate degree courses are also designed to be easily transferred to four-year degree programs. Each online associate degree in elementary education program is somewhat different, but the core courses tend to be similar. Students who earn an associate degrees in elementary education take courses in art, literature, music, science, physical education, and math. Certain classes also emphasize professional education and child psychology. Children's Literature: This course introduces the genres, authors, and illustrators of literature written specifically for children. It also provides a historical assessment of how literature has changed and been developed by investigating the various trends and techniques used in this medium. Introduction to Education: This class provides distance learners with a survey of education methods used in the classroom across the United States. Students learn information related to pedagogy, different types of learners, common issues facing students, and challenges found in the classroom. Developmental Psychology: This course emphasizes data, theories, concepts, and methods of philosophy as they relate to the emotional, cultural, cognitive, and physical development of children from birth to adolescence. HOW LONG DOES IT TAKE TO GET AN ONLINE ASSOCIATE IN ELEMENTARY EDUCATION? Online associate degrees in elementary education require students to complete an average of 60 credit hours. In most programs, associate degrees can be earned in two years and then directly transferred to a four-year institution. Many elementary education programs offer courses through a cohort model, where a group of students progresses through a program's classes together. This gives distance learners more opportunities to network with their peers and engage in group projects. However, if you are unable to participate in a cohort model, you should look for a program that offers individually-paced courses. Classes that are taught asynchronously provide students with more flexibility and adaptability when pursuing a degree. Earning an associate in elementary education allows you to work with young children in private and public schools as well as daycare and childcare centers. Teacher's aides, educational assistants, and other in-classroom positions are well-suited for individuals who hold an associate degree. Preschool teachers and other classroom workers generally work on 10-month contracts, educating young children in reading, math, science, and other fundamentals of early development. Preschool teachers work with children to teach them colors, shapes, and language and motor skills. They also help their students develop basic problem-solving techniques. Preschool teachers emphasize working together and keep records on the emotional and intellectual development of young learners. These professionals work with students from all ethnic and economic backgrounds. Teacher's assistants work under the supervision of classroom teachers to deliver educational material to students. They offer individual attention to children and observe and record information about the emotional and developmental progress of their pupils. Depending on their state of residence, childcare workers do not always need an associate degree in elementary education; however, this degree helps workers secure higher wages and better meet the needs of the children they oversee. Childcare workers watch young children on a day-to-day basis. Their tasks include a range of activities, including bathing and feeding. These professionals often have irregular work hours. A library assistant handles loans and returns, and with an associate degree in early education they can work with library materials aimed at young children. Library assistants answer reference questions, work with technological databases, and help patrons find library resources. Students who earn an online associate degree in elementary education often go on to pursue a four-year degree. Additionally, many associate degrees are offered in conjunction with four-year schools, guaranteeing transfer credits. A four-year degree in elementary education is required for teaching at the kindergarten, elementary, middle, and high school levels, as well as for teaching special education at any level. Teaching positions that require a four-year degree make more than twice as much as those that require only an associate in the same field. For example, elementary and kindergarten teachers with bachelor's degrees make $55,490 per year, while preschool teachers have an annual salary of $28,790. Bachelor of Arts/Science in Elementary Education: Bachelor's degrees in elementary education are offered as either BA or BS degrees, depending on the emphasis of the curriculum. An online associate in elementary education provides core mathematics, liberal arts, and science knowledge that is applicable to either program. Bachelor of Arts/Science in Special Education: An associate degree in elementary education is a common starting point for students who are interested in pursuing a bachelor's degree in special education. Four-year degrees in special education can be offered as either BA or BS degrees, depending on the individual school. Additionally, some schools have guaranteed transfer/articulation agreements in place for continuing students. Bachelor of Arts/Science in Childhood Development: A bachelor of arts or a bachelor of science in childhood development builds upon a two-year associate degree in elementary education by teaching students how to identify benchmarks and foster improvement in children from birth to their teenage years. These programs focus on establishing healthy learning and educational development. Bachelor of Art/Science in Family and Consumer Science: Bachelor's programs in family and consumer science are ideal for associate degree-holders interested in learning more about family dynamics and behaviors, effective communication, and healthy family interactions. There are numerous federal and state funding options for students pursuing a higher education degree. To find out what sources of aid you qualify for, you should first complete the Free Application For Student Aid (FAFSA). In addition to this resource, your school may have scholarships and grants that you can apply for. It's important to contact the schools you are interested in to learn about their financial aid resources and how you can access them.